Guess where I have been today with the boys. Yes it was haircut time and what a wonderful surprise - four puppies!! Three weeks old and just like little polar bears!! Luckily all spoken for so no temptation!! I just wanted to have a cuddle but didn't want to upset their mum. Finlay seemed fascinated by them and tried to get into the pen with them!! So sweet! Do you know what they are? 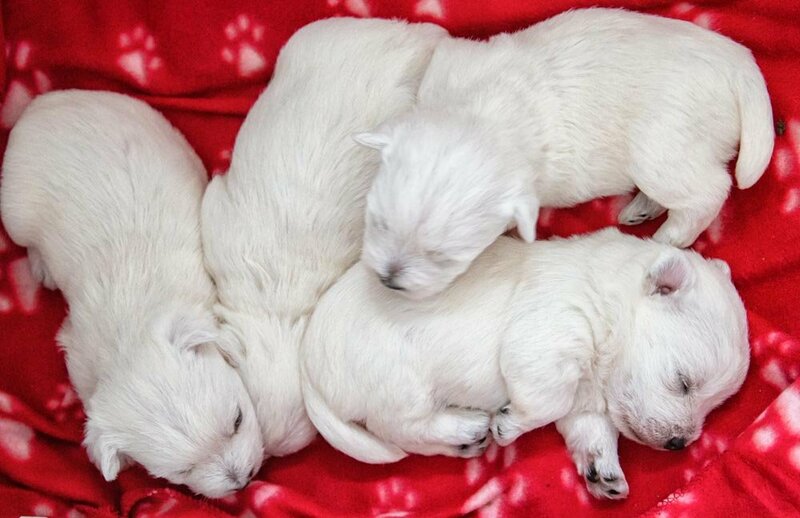 @stownsend They are Westies - West Highland White Terriers the same as Finlay and George. They are adorable! Hi, George and Finlay ❤️! Ah - now I see why you are there! Bet George and Finlay look so smart! Thank goodness they are all spoken for! @jamibann all taken thankfully! Finlay would leave home if I brought another puppy home! I think he was hoping I would leave George there! Lol! @pamknowler Thanks, Pam! So hard to tell when they are so little. Precious little things!